Do you ever get one of those days, where you loaf all day long? Isn't it wonderful? Not that you sit around all day long doing nothing. There is actually a lot i could have done: I could have done something, like row to shore and catch a bus to Marathon, run a few miles and get some exercise, go beach combing, tour the sand and sea nature center they have here at Bahia Honda. But no I decided to have a day on the boat. It was an absolute delight with blue skies and a gentle breeze with even time for an afternoon power nap. I got lots done too. The boat needed a good clean and I still had another inch or so of crab pot line wrapped around my prop. While I was down under the boat I cleared out some seaweed out of my raw water intake. The speed log too hadn't been working for a while, so I cleared the speed wheel of barnacles and slime. I caught up on a lot of reading, did emails and cooked myself a hot lunch. 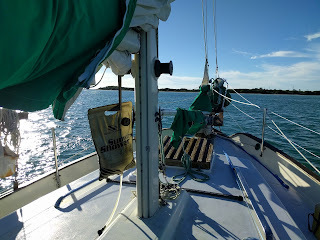 One of the daily rituals of living on a boat that takes a wee bit longer than landlubbers are used to, is having a shower. If you look under the boom, in the photo above, you will see my solar shower hanging in the sun, which works surprisingly well. It just takes a bit of effort to do and it is not exactly luxurious but hey, I'm living the dream right?